Toyota and Mazda were among the last major automakers to offer factory-installed CarPlay, but each has expanded its lineup of vehicles integrated with Apple's software, which provides convenient dashboard access to apps such as Phone, Messages, Apple Maps, Google Maps, Waze, Apple Music, and Spotify. I have carplay in my Nissan Leaf and it has a lot to dislike. First off, I was really ticked off to find you have to hard wire your phone to the car via a USB to Lighting cable before carplay will start up - it doesn't work over BlueTooth. WTF. Also, look at all of the front panel displays for carplay systems (including the one in the first post) - they never show Contacts because that capability doesn't exist. I couldn't believe that! I have lots of notes and other useful stuff within my Contacts on my phone/Mac but that whole aspect is missing totally in action in carplay. Anyway, carplay is better than the local GUI for the parts it replaces, but the implementation could be WAY, WAY better! Being wired in order to connect is the fault of Nissan. CarPlay could be wireless, and is on some vehicles. Interesting, a Corolla Hybrid (looking at it, sounds like it has the Prius's engine / guts in it so mileage should be very good). Has "available remote connect with AppleWatch" whatever that is - looks like you sort of make your watch a key fob for the car maybe - presumably through your phone, but maybe not. Nice to see Toyota rolling carplay out further (slowly) into their product line. meh ... I updated my 2018 Mazda6 to use CarPlay and was really disappointed in the experience. At least I didn't have to pay for it. I haven't played with it before. If you don't mind, what didn't you like about it? I got this installed in my 2016 3 last Friday after the update came out and while it was expensive it fixed the two things I liked least about my car: the Mazda Infotainment system itself, and the extremely under-powered USB port that was previously installed in the console. Honestly getting a USB port that actually charges my device vs. simply keeping it powered was worth it for me, and I've been enjoying CarPlay too. Not everyone may agree, but this was good for me. I thought of using my iPhone 8 mounted securely and with a properly installed power supply and bluetooth speaker also installed. But their is one problem: My iPhone 8 will not go into landscape mode on Home screen. It will go to landscape in every other situation and App. I have tried all the recommended fixes to date. CarPlay will be a standard feature in the all-new 2019 Mazda3 ('https://insidemazda.mazdausa.com/press-release/mazda-reveals-all-new-mazda3/'), excluding the base model, according to a company spokesperson. The vehicle is making its worldwide debut at the Los Angeles Auto Show this week and will be rolled out to global markets over the coming months, starting with North America in early 2019. 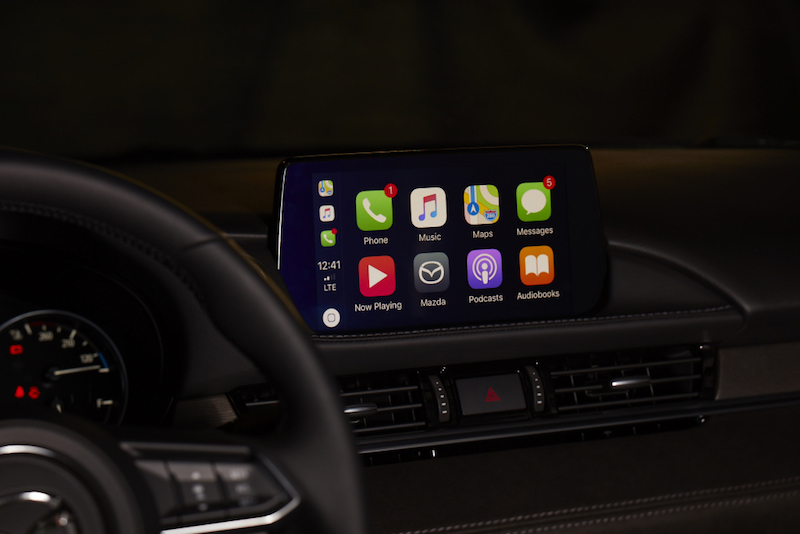 The 2019 model will be the first Mazda3 with CarPlay, accessible through the Mazda Connect infotainment system. CarPlay is also preinstalled in the 2018 and newer Mazda6, 2019 Mazda CX-5, and 2019 Mazda CX-9, with a $199 retrofit option available for select 2014 and newer Mazda vehicles ('https://www.macrumors.com/2018/11/21/carplay-mazda-2014-and-newer-vehicles/') in the United States. CarPlay will also be available as a standard feature in the 2019 Nissan Rogue Sport ('https://nissannews.com/en-US/nissan/usa/releases/nissan-announces-u-s-pricing-for-2019-rogue-sport') and 2020 Toyota Corolla Hybrid ('https://pressroom.toyota.com/releases/electrifying+design+meets+electrified+power+first+ever+corolla+hybrid.htm'), equipped with seven- and eight-inch touchscreens respectively. The new Rogue Sport is available now at Nissan dealerships in the United States, while the new Corolla Hybrid goes on sale in spring 2019. These fools are too late to the party. I just picked up a 2019 XC90. I was considering a Toyota Highlander but lack of CarPlay pushed me to Volvo. Though I must admit, Volvo’s Pro-Pilot assist also played a roll. You are probably better off with the Crosstrek. The C-HR looks nice (imo), but it is so freaking heavy. Which is really strange considering it doesn't have AWD, or a big motor. The Crosstrek has more power, but weighs a few hundred pounds less, gets better MPG and has AWD standard. They have also offered CarPlay as a standard for a couple of years now.